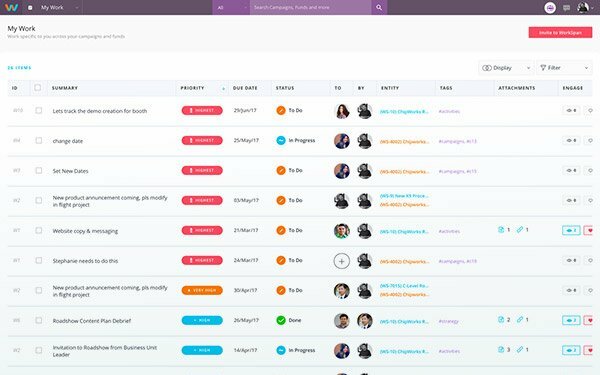 A new Silicon Valley startup is aiming to make it easier for marketers to coordinate and collaborate across channels, teams, and companies. WorkSpan announced a $9 million series A funding round on Tuesday. Led by Mayfield, the financing was unveiled in conjunction with the company’s global debut after an early availability program. The funding will primarily be applied to go-to-market efforts according to a company representative, and WorkSpan also plans to expand its sales, marketing and customer success teams. Founded in 2015 and based in Silicon Valley, WorkSpan is a marketing network where teams and individuals can collaborate on various projects. It helps marketers coordinate marketing programs and campaigns with each other to plan, fund, build and measure the effectiveness of campaigns done together. Whereas a marketing cloud primary focuses on delivering content to consumers on the front end, a marketing network facilitates the development of campaigns across teams on the back end. WorkSpan already has several major tech companies as customers, including SAP, Intel, CenturyLink, and Infosys. Steve Asche, VP digital and partner marketing, Digital Enterprise Platform Group, SAP, says that using the network has significantly reduced time spent on coordination while doubling the number of campaigns and tripling marketing impact. Large brands might have hundred of people working on marketing, ranging from internal company communicators to partner ad agencies and PR firms. WorkSpan’s Marketing Network helps companies execute joint marketing programs by enabling internal teams and external partners to coordinate marketing campaigns from a single system of record. When integrated into a marketing stack, WorkSpan provides insight into the marketing activities of everyone in the network. For example, a company chief marketing officer could evaluate the email marketing campaigns from their entire affiliate network to see what strategies are performing the best. WorkSpan supports a variety of email software and marketing automation providers, including Hubspot, Microsoft Dynamics, On24, Box, Eventbrite, Salesforce, SAP, Marketo, Eloqua, Pardot. Marketers can also collaborate on creating marketing content and publish it across channels. In addition, companies can securely seek marketing funds or make funds available to partners, and solicit or submit campaign proposals.